UPLINX Track & Audit creates comparison reports that show changes to Cisco Unified server configurations, including change details, the time and which user made the changes. This answers the questions what, when and who has done configuration changes of Cisco CUCM, CUC and IMP. Changes are found by comparing configuration reports and optionally by merging Cisco Audit Logs. 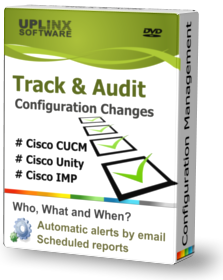 Configuration and audit-comparison reports for Cisco CUCM, CUC and IMP are generated by a scheduler and stored in a report repository. The UPLINX comparison algorithm detects any configuration changes - including additions, deletions and updates - and presents the previous and new value in color-coded markup. Added or new values are shown in green, deleted values in red and strike-through. Items or values which have not been changed remain in black. UPLINX Track & Audit: Web-based enterprise-grade system with scheduler, email alerts and access control to reports. UPLINX Report Tool: Windows desktop application, reports can be generated manually or scripted. The following image shows an update to a Music-On-Hold (MOH) configuration on CUCM within an audit report. Detected changes are found by the UPLINX comparison algorithm, and Cisco Audit logs are merged into the change which contains user-id, time of change and Cisco audit log details. Cisco Audit Logs improve the accuracy of the time stamp (when), user-id (who) and configuration change (what). Cisco Audit Logs are a standard Cisco Unified Communications feature and can be enabled on CUCM, CUC and IMP servers with the steps to 'Enabling & Retrieving Cisco Audit Logs'. 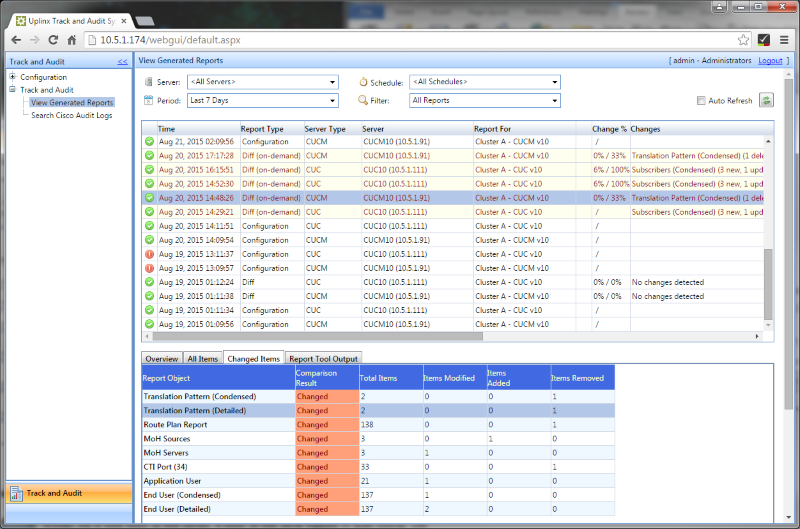 Generated configuration and audit reports can be accessed on the web-based Track & Audit console. Access to reports can be restricted to particular users and limited to specific servers. User authentication to access reports can be based on locally configured passwords or can use Microsoft Active Directory to have the same login details as on a windows PC. Email alerts can be triggered when any or specific configuration items (such as device pool, CSS, phones, route patterns or voice gateways) change. Read more about 'Email Alerts'.